Yet another reason Japan needs to get serious about sportier versions of its people carriers. Honda UK took the early morning hours of May 8th to announce assigned pricing for the new Civic Type R, and if the numbers on the checks our cousins across the pond have to write in order to get behind the wheel are in any way indicative of what US buyers will pay, we have a lot to be excited about indeed. Not that the Type R wasn’t exciting on its own merit. With its 2.0-liter four-cylinder engine making 316 horsepower and 295 lb-ft of torque, this front-wheel drive monster will be anything but tame. The best part of the deal, at least for UK buyers on a budget, is that the Type R can be had for £30,995 ($40,181), which is less than the £32,540 ($42,184) Ford Focus RS and its previous greatest threat, the £31,885 ($41,334) Volkswagen Golf R. To be fair, the price difference is to be expected given that the Type R only uses its front wheels to put down its power while its competitors have more expensive all-wheel drive systems to accomplish the same feat. Still, the lack of all-wheel drive didn’t seem to hinder Honda’s Nurburgring run, which made headlines when the sedan lapped the Green Hell in 7 minutes and 43.8 seconds, making it the fastest front-wheel drive machine to do so. If US pricing stays within the same boundaries as UK prices, the Type R will be cheaper than its competitors and open the segment up to Si buyers who want more. UK buyers also get to pick between two Type R variants, the standard car and a higher trim dubbed the Type R GT. 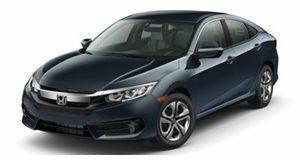 Tick this box off and Honda will throw in a few goodies like blind-spot information with cross traffic alert, dual zone climate control, Honda CONNECT embedded in the Garmin navigation system, wireless charging, an auto dimming rear-view mirror, a high power audio system, and LED fog lights. We’d wager those features will be available to US buyers along with the auto rev-matching six-speed manual when the Type R makes landfall later this summer or in early fall.